Abby Jones, 42, of Jonathan Alder leaps for a layup against Bishop Watterson. Jones tallied 18 points during the Lady Pioneers’ 59-44 loss. The Jonathan Alder Lady Pioneers had a big task at their feet on Monday as they squared off against the Division I Central District four seed Bishop Watterson. That task seemed a bit to large for the Lady Pioneers (13-4) as they fell to the Eagles, 59-44. The Pioneers kept pace with the Lady Eagles by setting up an early press to help slow down Watterson. The Eagles (19-2), though, handled the pressure well for some open looks to take an early lead. Head coach Steve Cawley decided to pull his Pioneers back to get better pressure on the solid Eagles’ shooters. “We like to pressure every game when we come out, but we weren’t getting anything out of it tonight,” he said. “They were able to handle our pressure and they were getting open shots on the other end. Jon Alder kept the Eagles within striking range with some solid shooting from Abby Jones, who tallied nine points in the opening stanza. Mary Ferrito also found success from the free-throw line, going four-for-four to help the Lady Pioneers tally 17 points in the quarter. Watterson, though, took a 20-17 lead at the end of the first set. In the second quarter the, Lady Pioneers continued to shoot the ball well with help from the bench. 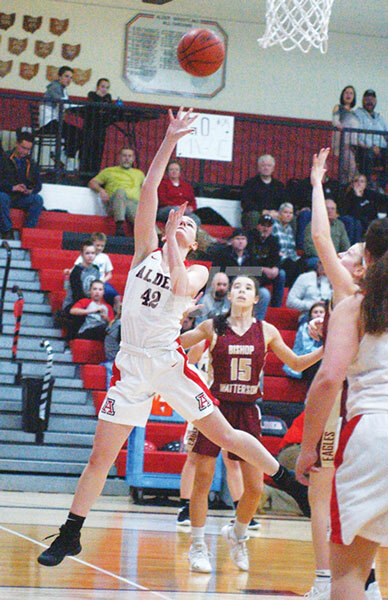 Emma Shepard kept JA in the hunt with four markers to help the Alder score 13 points. The Eagles ran some solid screen plays that gave them open looks for buckets that kept the lead in their favor. Watterson took a 37-30 margin at the turn. Despite BW’s half-court trap, JA found the low pass under the basket to close the gap to four points. Some woes on the defensive boards, though, allowed the Eagles to maintain a 47-41 lead. “We knew they were going to throw that half-court trap at us, so we were prepared for it,” Cawley said. “It was the first time we have seen a half-court trap the whole year, so we executed fairly well and hurt them a couple of times. The Eagle defense shut down the Lady Pioneers in the fourth set and kept the JA shooters to the outside. As such, JA tallied only three points on Jones’ trey. Despite the final score, Cawley was happy with the Lady Pioneers effort. The Lady Pioneers will return to the court on Wednesday when they travel to Springfield Shawnee. Rabold 6-3-17, McGuff 6-2-15, Woodford 4-2-12, Jenkins 4-1-9, Grim 1-3-6. Totals 21-11-59. Jones 7-2-18, Walbon 3-2-8, Ferrito 1-4-6, Shepherd 1-2-4, Jakse 2-0-4, Bourquin 1-0-3, Parker 0-1-1. Totals 15-11-44.